Rome Sacked again (410) - After its defeat at Adrianople, things began to deteriorate rather quickly for the Roman Empire. The Germanic tribes were settling in to Roman territory and were there to stay. Emperor Theodosius of the Eastern Empire tried to make the best of the situation by using the new "citizens" to supplement his army. This arrangement was put to the test in 394 at the Battle of Frigidus. It was a conflict between the two Roman Empires, East versus West, and arose out of a dispute over who would succeed Western Emperor Valentinian II, who died in 392. Among the soldiers in ranks of Theodosius' forces was a Visigoth named, Alaric. He had distinguished himself as an exceptional warrior and quickly rose within the military hierarchy. By all accounts, he had been content as a Roman citizen and soldier. However, at the Battle of Frigidus, while the Eastern Empire was victorious, it suffered heavy losses. Moreover, Alaric noticed that more than half of all the Visigothic soldiers who fought in the battle were killed. He became convinced that Roman authorities were attempting to kill off his people by committing them to the most dangerous positions in war. Theodosius died in 395, and the Visigoths, who expressed no particular allegiance to the Roman Empire, began acting more and more like an autonomous nation. And Alaric was the man they began to view as their leader. The break came a year after Theodosius' death in 396 when the Visigoths decided to carve out a piece of the empire as their own in between East and West. Alaric led them south into Greece, which was virtually undefended. They marched all the way to Athens and looted it. 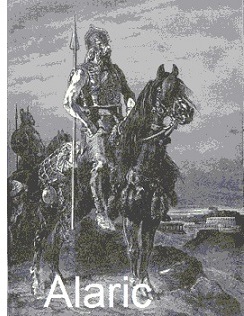 A Roman general, Flavius Stilicho, was dispatched to put an end to the uprising. The Visigoths fled and headed toward Italy. In the meantime, the capital of the Western Empire had been moved to Ravenna in 402, in no small part out of fear of the growing Visigothic threat. That same year, the Visigoths entered Italy, but were repelled by Stilicho at the Battle of Pollentia. Alaric returned to Gothic territory in Illyricum. However, General Stilicho died in 408. With his rival now gone, Alaric tried another invasion of Italy in 408. This time he made it all the way to Rome. The city had no defense other than its walls, and so its citizens barricaded themselves inside. They began to starve and die from disease because of the unsanitary conditions. So they sued for peace and bought the Visigoths off for 5,000 pounds of gold and 30,000 pounds of silver. Emperor Honorius feared another attack, and tried to have Alaric killed by having another Goth assassinate him. 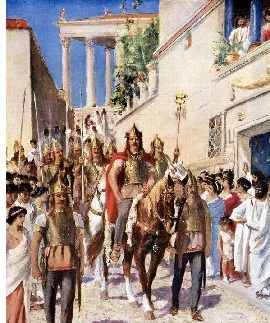 The attempt failed and Alaric responded by marching on Rome again in 410. This time, slaves (who were still used in Rome), opened the city gates and the Visigoths poured in. They looted the city for three days and destroyed selected parts of it. For example, they desecrated the tombs of Augustus and Hadrian, but still left the city largely intact. When they were done, they traveled south and Alaric made plans to invade Africa by sea. But he died along the way, and the Visigoths eventually established their kingdom in Western Europe in the Iberian Peninsula and southern Gaul. Even though Rome was no longer the capital, it was still a severe psychological blow as the city represented the foundation of the empire. It was the first time that a foreign army entered the "eternal" city in 800 years, when it was also sacked by the Gauls under Brennus (see "Rome sacked" early on this timeline). It's final downfall was only a matter of time.